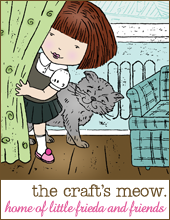 The Craft's Meow - New Release Blog Hop! Hello friends! 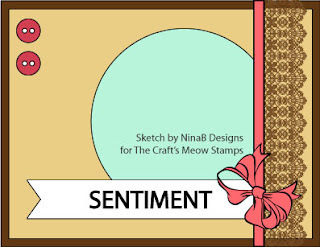 Today is the big day, new release day - over at The Craft's Meow, where you will find all four sets we've been previewing this week, including Stitched Sentiments II which is the gift with purchase this month! If you are hopping over from Jean's blog, you are in the right spot! If not, head over to the TCM blog to get started! I decided to use two sets, Zoom Goes My Heart and Valentine Wishes for this CAS card. 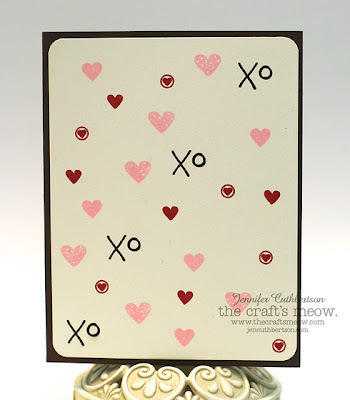 I took hearts from both sets and stamped them in pink and red onto a cream card base. 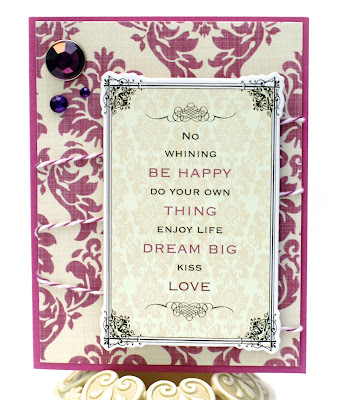 I added the "XO" sentiment from Valentine wishes and stamped it diagonally across the card. I love how easy these sets are to combine and I've tucked this card away for my hubby! Now for the good stuff - a chance to win all four sets!! Please visit and comment on each blog on the hop by 9pm, December 2nd. Very cool!! 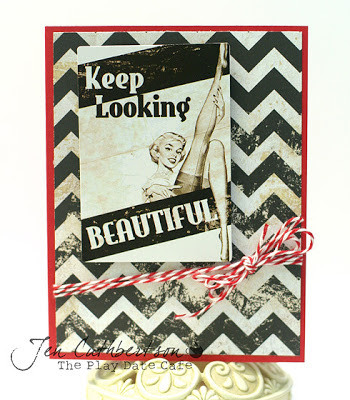 Thanks so much for visiting today and off you go to Jen's blog for more inspiration! The Craft's Meow - Day Four Previews! This is my second post of the day. If you are looking for this week's Play Date Cafe color splash, please scroll down. Hello friends and welcome to preview week with The Craft's Meow where we will be showcasing four new sets that will be available for purchase on the 30th! 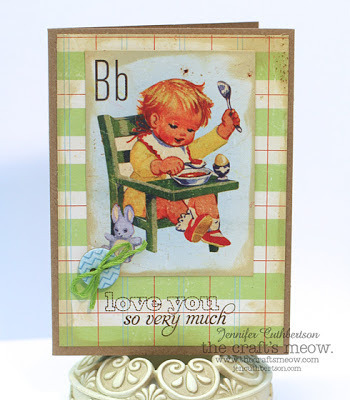 Today we are showcasing a set designed by Karen Baker called Zoom Goes My Heart! 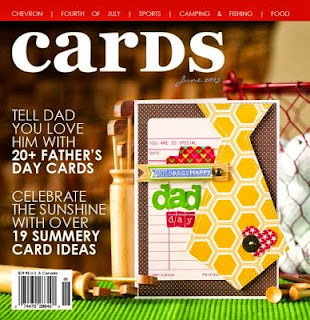 This is a fun set with all sorts of images that you can use to build all sorts of cards! I just love how great this set will be for all of the cards I make for my husband! For this card, I started off with a couple of patterned papers and then stamped the meter and needle images and then built the sentiment with two more stamps. See...so many possibilities! I finished the card with a faceted gem that says "hubba bubba" - how cute is that?! Thank you so much for visiting today and don't forget to leave a comment back on the TCM blog for a chance to win this set for yourself! I was inspired by the photo as well as the splash color when I made my card. Isn't that tricycle awesome! I've been enamored with my Cashmere Dame papers this week (yes, you'll see more...) and thought the black and white chevron background would be the perfect stage for the pop of red cardstock and baker's twine. I finished the card with a sticker from the collection backed on cardstock and then popped up with foam tape. 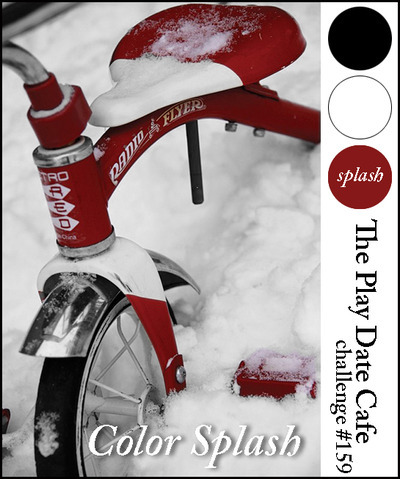 Thank you so much for visiting today and I can't wait to see what you create with this splash challenge! The Craft's Meow - Day Three Previews! Hello friends and welcome to preview week with The Craft's Meow where we will be showcasing four new sets that will be available for purchase on the 30th! Today we have another wonderful set from Nina B Designs called "Beautiful Shelf" which is full of vintage and sentimental images you will love! So I have to admit something - I have been in love with the Cashmere Dame collection from Crate Paper for a long time and it has been sitting in my craft room virtually untouched until this week! When I saw the sentiment in this set, I knew they would fit together in perfect sassy company! I started off with the gingham background paper and used the faux stitching on all four sides using a little bit of masking on the corners. I stamped a word bubble sticker from the collection with the "hello, gorgeous" sentiment and finished the card with a cherry faceted gem and added some red rhinestones over some of the cherries for some extra sparkle. The Craft's Meow - Day Two Previews! Hello friends and welcome to preview week with The Craft's Meow where we will be showcasing four new sets that will be available for purchase on the 30th! 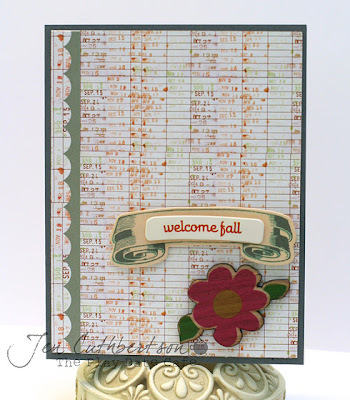 Today we are showcasing a companion in the "Stitched" series by Nina B Designs, "Stitched Sentiments II". Not only is this a perfect set to add to your collection, it is also free with a $50 purchase this month! 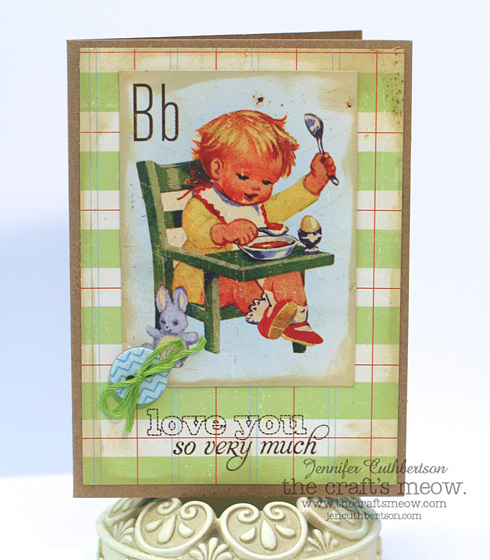 For this card, I started off with a kraft card base and a plaid paper background. I added a coordinating journaling card and button tied with some green embroidery floss and finished with one of the amazing sentiments from this set! After it was finished, it looked like the perfect little addition to a baby book or to send to new parents! Hello friends! Today is my final sneak peek of a project I made with the November, Christmas Treats kit from Paper Made Bakery! I hope you can head over there to check it out! We'll start showcasing the brand new December kit in just a few days!! Woo hoo!! Thank you so much for stopping by today and I can't wait for you to see the projects the DT has cooked up with the December kit! Fun!! The Craft's Meow - Day One Previews! Hello friends and welcome to preview week with The Craft's Meow where we will be showcasing four new sets that will be available for purchase on the 30th! First up we have a wonderful set from Mabelle R-O called "Valentine Wishes" which has three adorable images and a number of love sentiments! 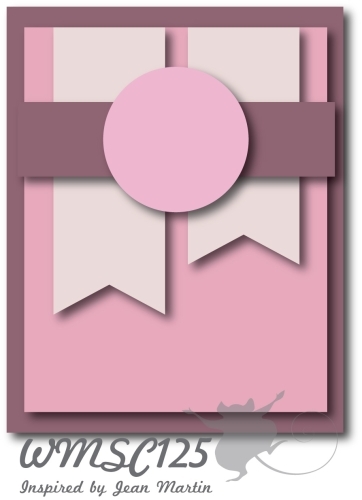 I started off with a medium shipping tag which I covered with some pink patterned paper. I stamped the image with the little girl onto the tag and then onto a piece of white cardstock so I could color parts with my Copic markers. I then stamped other parts of the image onto coordinating pieces of patterned paper and pieced them all together for this whimsical tag! I finished with some baker's twine and the love sentiment from the set. Hello friends! Today marks the beginning of a brand new week at Waltzingmouse Sketch Challenge! I hope everyone here in the US had a wonderful Thanksgiving and everyone else had a wonderful week! This is such a time of reflection for me and I am truly blessed in my life! I am so thankful for all of you who visit my blog and who have encouraged me in this craft! It is such a wonderful "home away from home" - I truly treasure it! Check out this wonderful sketch from Jean we're using this week - it is so much fun and I can't wait to see what you create with it! I've got to keep this short as we've got some pie to eat! But, I used a new set - Camellia, and I just adore it! One of my favorite things to do is piece stamped images and this big flower is just perfect! I stamped it twice onto pink cardstock and cut the center out of the second and popped it up. I layered some coordinating papers and finished the card with a piece of crochet trim! Thanks so much for visiting today and I'll see you back here a lot more next week once I get back into the swing of things after vacation! It is so nice to have a few days off and my hubby and I are enjoying some r&r together! Hello friends! 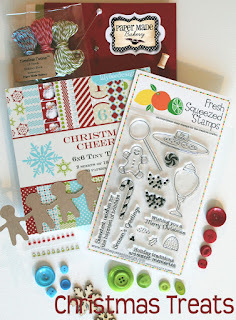 Today is blog party day with Waltzingmouse Stamps and I'm so excited to party along with other fans! If you're new to this whole thing, head over to the WMS blog to find out more and if you're early enough, there will still be time to play along! The theme for this month's party is "Gratitude" and I chose to use this week's Waltzingmouse Sketch Challenge sketch inspired by Mischief Maker, Karin Akesdotter! 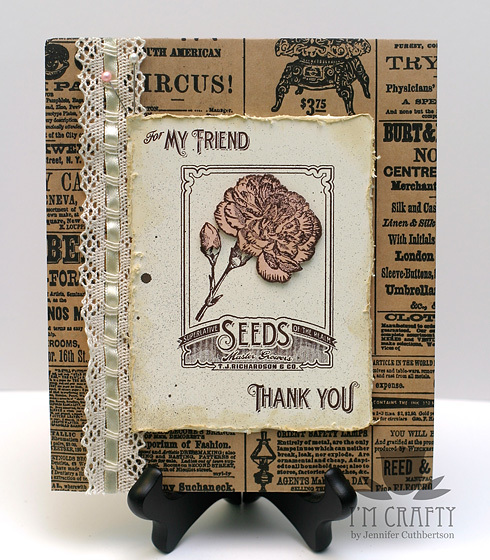 I just received my new Vintage Garden - Seed Packet and wanted to make a little thank you gift bag for a friend. I recently unearthed these wonderful vintage-inspired treat bags (a little bigger than a scone bag from a coffee shop or bakery) and thought they'd be perfect for the project I envisioned. I stamped the seed packet and two sentiments from the set onto a piece of cream cardstock and distressed the edges with a tool and some ink. I also misted the panel (and my hand) with some Tattered Angels. :) I haven't yet figured out a good place to mist so try to do it carefully over a trash can in my studio (over cream carpet - yikes!) I stamped the carnation on some pale pink cardstock and then inked over it with a little bit of the same distress ink to tone down the pink. I finished the little bag with some crochet trim and two stickpins. Thank you so much for visiting today and I can't wait to see the projects you create both for the blog party and the sketch challenge! Link up to the sketch challenge by Friday and one random participant will be selected to win a stamp set of their choice from WMS! How cool is that?! For my card, I started off with a slate card base and used a new kit that just came in the mail - Acorn Avenue by Crate Paper! I just love the 70's feel of this kit - reminds me of my childhood for sure! I used one of the papers patterned with library card stamps for the background and the patterned edge of another paper for the scallops on the side. 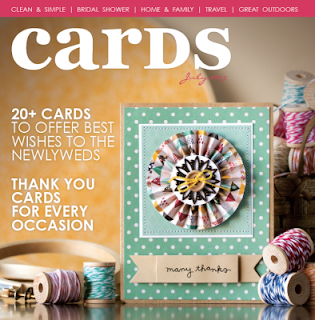 I finished the card with a chipboard sticker and a wooden flower from the same kit. No stamping for me this time which was odd but I've been having a bit of trouble with the old mojo lately and tried to keep it simple. Thanks so much for visiting today and I hope you have a chance to play along as the winner of this challenge will receive a wonderful prize from Scor-Pal! Hello friends! Today we're celebrating the upcoming holidays with a holiday blog hop from The Craft's Meow! If you're here from Jean's blog, you're in the right spot. If not, head over to the TCM blog to get started! I chose to use Christmas Cheer which was one of the sets released in October and I just adore the whimsical imagery of this set! 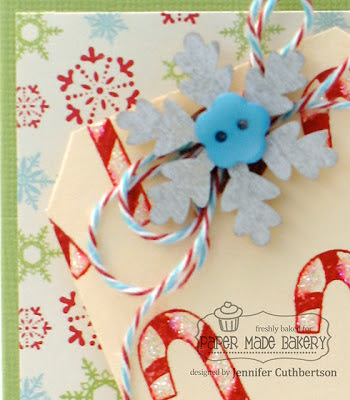 I started off with a little paper bag (like the ones you get scones in from a bakery or coffee shop) and stamped the snowflake in white craft ink. I then tore some white glitter cardstock to make a snowy bluff for the little snowman and trees to sit. 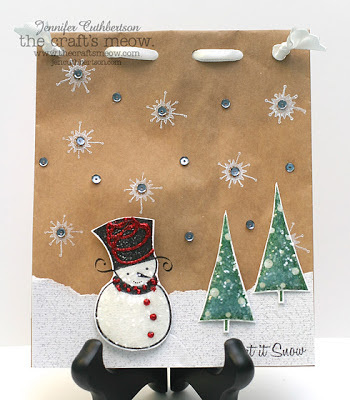 When I cut out the snowman and trees, I covered them with Glossy Accents and then covered them with chunky glitter. I just love how that looks! I finished the snowman with some red Stickles and added some pewter sequins to the bag for some added sparkle (not like it really needed it, I just love sequins!) :) I folded the top of the bag over and punched some holes in the top to thread some white satin ribbon to close the bag. I really like how this turned out and will be entering it into the Moxie Fab Stitching and Sewing Challenge, too! Now for the prizes! Make sure to comment along the way to be eligible to win your choice of stamp set from TCM! Comments must be left by 9pm PST, Wed Nov 14th. Thanks so much for visiting today! Next up is Jen with some more fabulous holiday inspiration! Hello friends! Today I'm so excited to preview this wonderful new sketch at Waltzingmouse Sketch Challenge by our very own MM, Lenet Mos! I started off with some fun papers from the Midway collection (now that I've gotten it out, I have a feeling I will be using it more and more!) 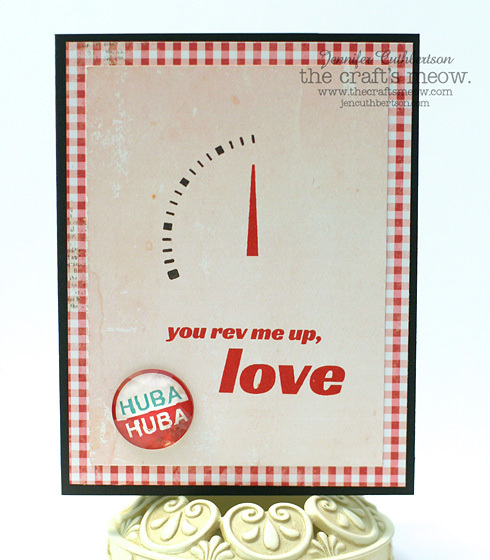 I stamped the sentiment onto a sticker from the collection in gray ink to match the papers and finished the card with another sticker and button from the collection. I hope you have a chance to play along with us this week and remember the change in the rules - you don't have to use WMS stamps to play along but we sure love to see them! :) Have a great weekend! In other news, we have a skunk! Not a pet or anything but apparently one felt like taking a wee dip in our pool last night! We thought we smelled something when we were watching tv and when Glen went out to check on it (I was inside claiming "no shoes"...), we found wet footprints all around the decking of the pool. We've been having fun getting to know our wildlife neighbors being that we live next to open space now (the cutest little hummingbird couple, a frisky raccoon, an owl, and my little friend the lizard who lives in the rose garden) but this was a bit much. Here's to hoping Mr. Skunk doesn't take a liking to our yard! Thanks so much for stopping by today and I sure hope you have a chance to play along with us this week! I feel bad for fall/Thanksgiving as now that Halloween is over, we're going straight into Christmas! I couldn't believe how quickly the Walgreens by my office swept clear the orange and black and swept in the red and green! Anyway, I am feeling very thankful these days and wanted to use some of my wonderful fall-colored papers! I started off piecing two flowers from Hope Blooms onto a cream circle die cut. 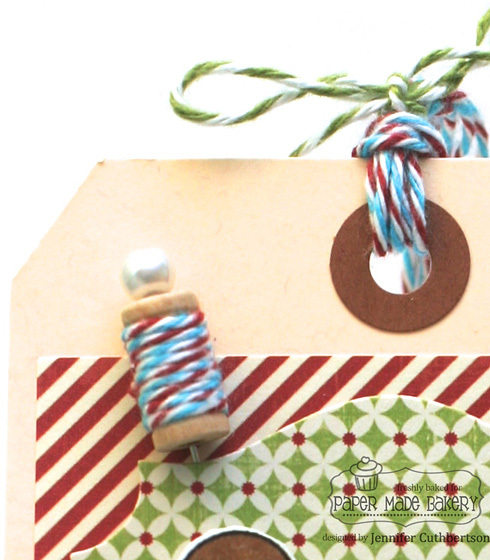 I layered a tag I stamped with a sentiment from Fall Blessings over some coordinating patterned papers and added some buttons and brown ribbon to finish it off. Paper Made Bakery - Release Day Blog Hop!